Preparing to bring your child in for an outpatient surgery or procedure at the hospital can often feel more stressful than the event itself. Children don’t typically welcome the prospect of a day at the hospital, no matter how short it may be. Parents often find themselves wondering how best to manage the difficult task of preparing their child mentally and emotionally for a surgery or procedure. Sometimes in order to prevent tears and fears, parents may try to mislead or avoid the conversation with their kids in order to simply get them in the door. Even though it may be tempting to tell your child that they are going elsewhere in order to get them in the car, or tell them that they are going to the hospital but not tell them why, this often causes more upset and challenge in the end. A child typically trusts their parents more than anyone else in the whole world. If they are told by a parent that they are going to Disney World or Universal Studios, then that’s what they will expect. If they’ve been told they’re going to a theme park and then they find themselves at the hospital, the child is likely to become very upset and very confused. While many may think those emotions are felt just because they don’t want to be at the hospital, they are mostly rooted in the fact that they recognize their parents were not honest with them, and that can be very shocking and upsetting. Once the child knows they have a hospital visit on the agenda, the questions will probably begin to come. Will I get a shot? Will it hurt? Why do I have to do that? Simple yet clear and honest answers should follow. However, if your child is preparing for a surgical procedure, pulling up a video on YouTube or a Google search outlining the details of the procedure is probably a bit much for most children. Children respond well to simple explanations that are concrete. For example, just telling your child that a procedure will be done because they are “sick” can be too vague. Children get sick often for many different reasons, and not each time requires medical intervention. So, simply describing the part of their body that needs help or what isn’t working well can be a good start. This also helps explain to them why the procedure is necessary. Maintain your focus on the things your child will be awake for and that they are able to make choices about. A good example of this is giving them options for the type of juice or popsicle they could have when they wake up or are ready to go home. No matter what procedure or surgery you are discussing though, please remember that these are never to be presented as a form of punishment for your child. When a parent takes their four-year-old to Toys R Us and the child sees a toy they want, they obviously will ask for it. If the parent’s reply is something along the lines of “not today,” the child will likely protest and proceed to ask about it again every single day afterward. They don’t forget about that toy. Younger children (between three and seven years of age) have trouble understanding the concept of time because it is very abstract. In the same way, if a child knows of the hospital visit, they are likely to ask about it daily because that is the moment they are in, and they will want to know if the hospital visit will happen that day. If it’s still a week or so away, it could make a very long week for parents. 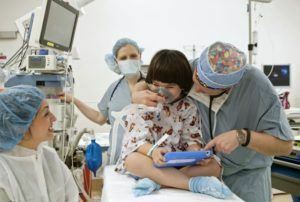 Telling a preschool-aged child the night before a procedure is appropriate, as is telling a school-aged or pre-adolescent child a week or so beforehand. But…. While age is a factor along with timing, just as key are your child’s coping skills and their levels of anxiety. Just like adults, some children are worrywarts, others are very laid-back and don’t seem to be phased by much at all. It is important to understand how your child will process the information best and how they will handle the information they are given. Once the child knows what is going on, be prepared to follow up and discuss it with them again closer to time for the procedure, no matter what their age. 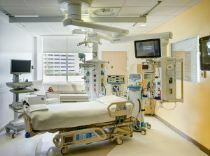 Preparation is key to helping reduce anxiety about hospital visits, which is a goal that all families and staff share. Arnold Palmer Hospital offers a pre-op tour called “Project P.L.A.Y” (Pre-admission Learning And You) which is available to children who are having surgery. The tour is led by a Child Life Specialist and walks children and their families through the steps that a child will go through and also can discuss why the child is having the surgery. We highly recommend this free tour to our patients and their families. Many hospitals around the country offer similar tours–please enquire at your own local hospital if your child has an upcoming procedure or surgery. Lendy Chapman has been a practicing Certified Child Life Specialist for almost 13 years, the last 10 of which have been at Arnold Palmer Hospital for Children in Orlando, Florida. She has practiced in multiple acute areas, and is currently at the NICU. Lendy has also presented at national Child Life Conferences and participated with Operation Smile (http://www.operationsmile.org/). She acquired her Masters degree in Health Communications in May 2015. In her spare time, Lendy enjoys going to the beach, reading, and spending time with her daughter, Sadie.